Our company is one of the leading Manufacturers, Exporters and Suppliers of a wide range of Rubber - Metal Bonded Components. We offer them in a variety of sizes. Our company is engaged in designing and fabricating of Rubber - Metal Bonded Components using the latest technologies and premium raw materials. Thus, our entire range is quality assured and renders long service. 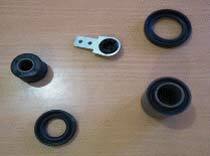 Interested buyers can get Rubber - Metal Bonded Components from us in bulk and expect on time delivery. On request, we provide individually tailored solutions.